We are excited to see final finishes being put in place throughout the new home. Many are covered and protected after installation, but we’ve found a few we can show off here. The kitchen backsplash tile looks great with the counters, and it echoes the linear look of the Great Room fireplace opposite it. 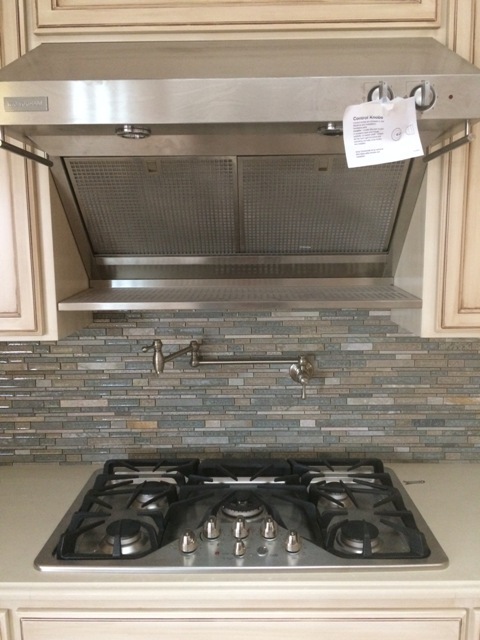 Here you can see the cooktop, pot filler, and hood. Notice that the hood has an integrated warming shelf. The Great Room fireplace has really come together, though there are still a few items on the To-Do List: the gas fireplace awaits its finished glass face, and cabinets await doors that will be installed in the next few days. 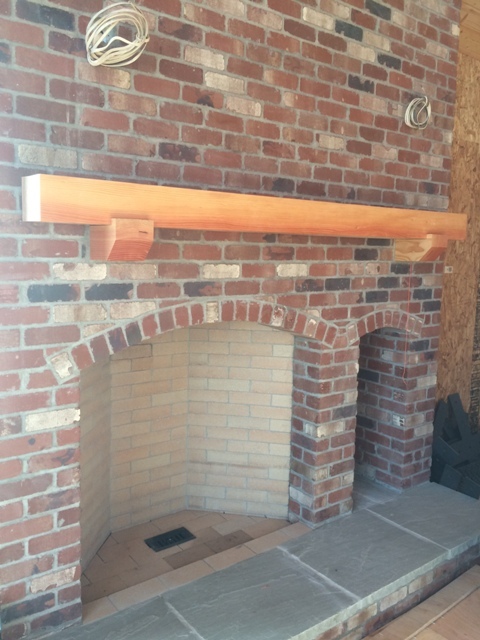 The Douglas Fir mantel is protected here. 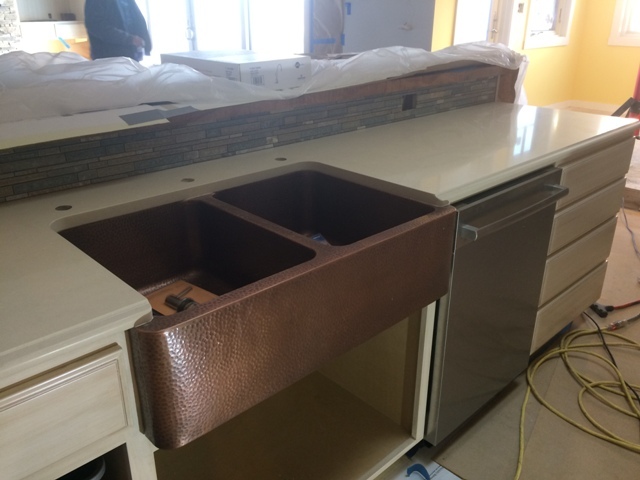 The Copper kitchen sink is installed with Caesarstone “Buttermilk” quartz countertops. The edge of the Oregon maple island top can barely be seen here, above the backsplash tile. The Den fireplace is now complete, with its Douglas Fir mantel and new hearth extension. Wall sconces are on the way. 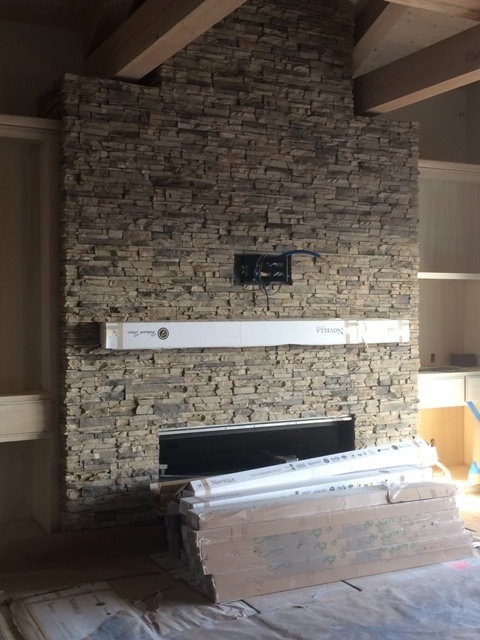 In the Master Bedroom, the fireplace stone is in place. 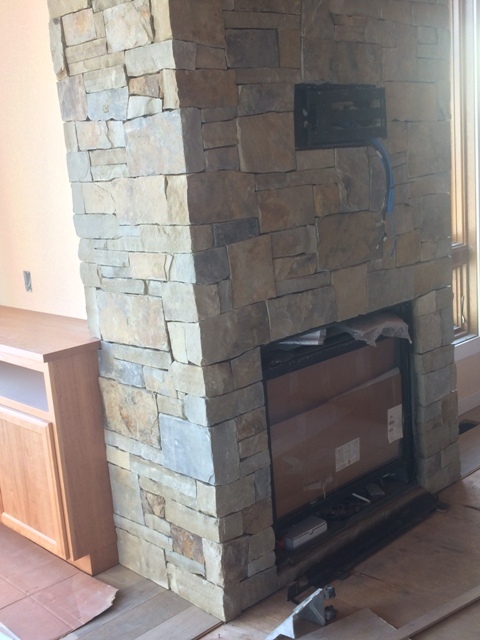 The gas fireplace’s finished front will be installed soon. On the floor beside the fireplace, you can see some of the hardwood flooring that will border the room. Wallpaper abounds throughout the home. 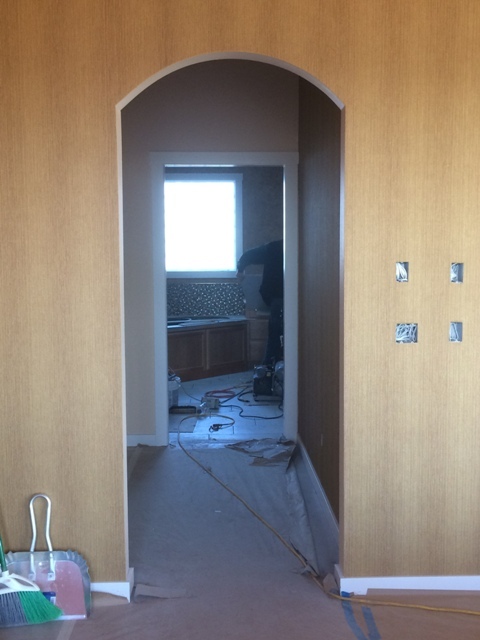 Below is a view of the wallpaper accent wall in the Master Bedroom, looking through to the Master Bath beyond. 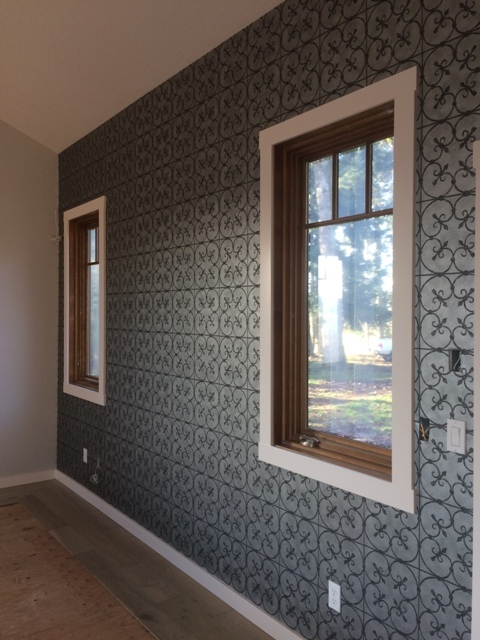 Here is a view of the wallpaper accent wall in the Guest Suite. Again, you can see the hardwood flooring bordering the room; carpet will be installed in the center of the room. Notice the combination of stained windows and painted trim. 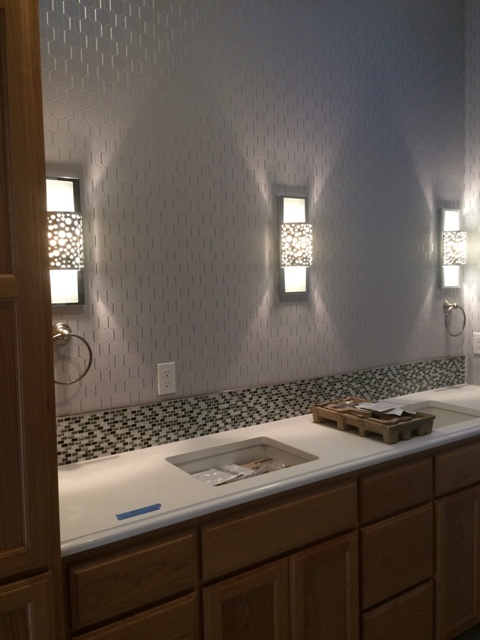 In the Guest Bath, all of the finishes are in place. Once the faucets are installed, this will be the first finished room of the house! 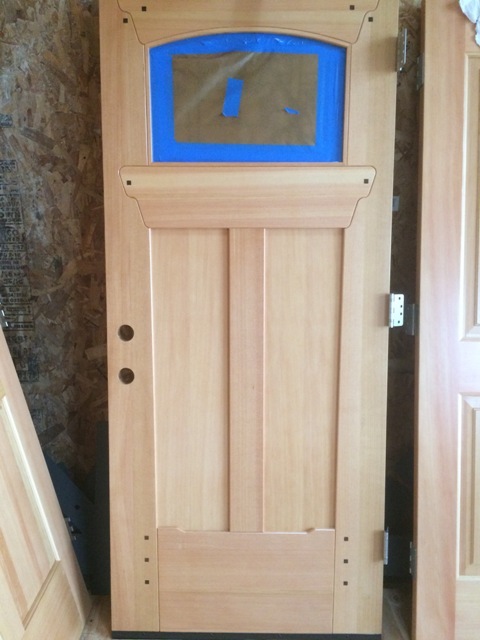 The Douglas Fir front door has been lacquered, and it is gorgeous! We love its design and details. It has is a beautiful stained glass light, protected here. 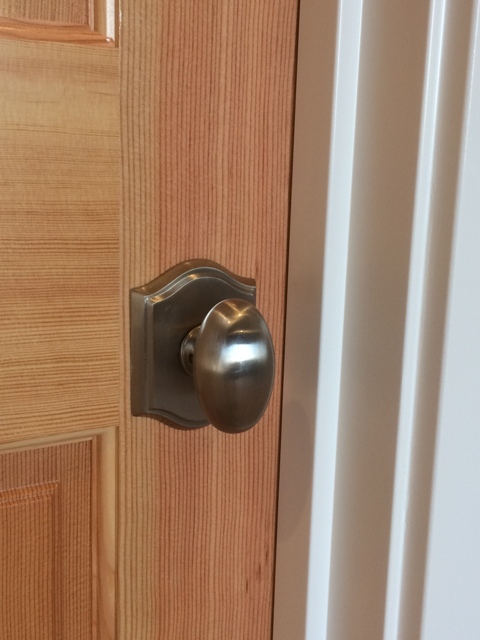 Stained Douglas Fir doors throughout the house are paired with painted trim and satin nickel egg-shaped knobs and arched rosettes. 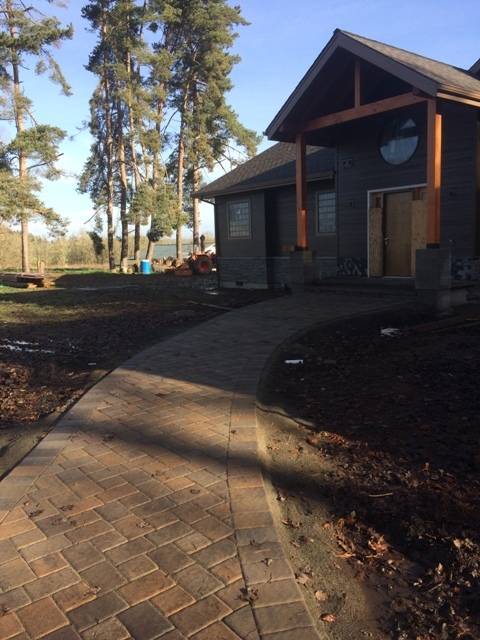 At the covered back porch, paver installation is complete and the gas fire pit is in position. 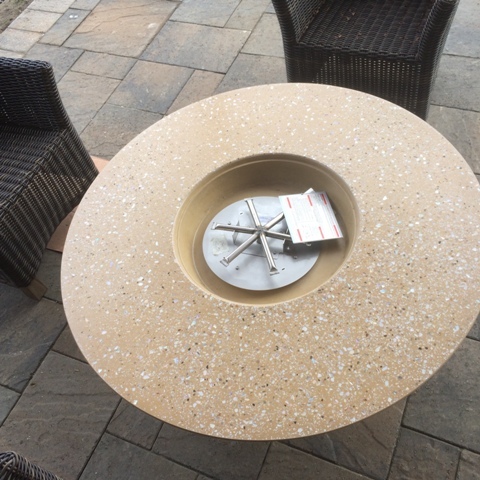 Once installation is complete, flames will rise from a bed of fire glass in the center of the fire pit. S’mores are calling! And lastly, the paver walkway and steps to the front door have been built. Landscaping will follow in the spring. We will continue to provide updates as things come together!